In their second game of their Texas road trip, Little Rock (LR) women’s volleyball fell to Texas State (20-8, 11-2 Sun Belt). Texas State dominated the match winning the first and third sets 25-16, respectively. They also won the second set 25-21. The Trojans held leads in each set and appeared as if they were going to take the second set after leading 13-10 before a Bobcat timeout. Texas State then scored eight unanswered and didn’t look back. 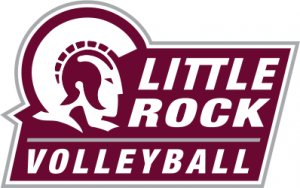 LR’s junior middle blocker Veronica Marin led the team in kills (9) and blocks (3). Taylor Lindberg contributed 29 assists and six digs. Sydnee Martin had a team-high 19 digs. The Trojans return home on Nov. 10 (Senior Night/Homecoming) to host Arkansas State. LR (9-18, 5-10 Sun Belt) needs a win or a Troy loss to secure a spot in the upcoming Sun Belt Conference tournament.